On Friday, April 29 I attended a forum in Chicago hosted by the Alternative Schools Network, The Chicago Community Trust and the Woods Fund of Chicago. More than 200 guests attended and the panel included many high profile public leaders. Research was provided that shows that jobs for youth are declining and that African American and Latino youth living in cities like Chicago are further behind. These studies show the link between education and income, and illustrate that for each youth who gets a high school degree there can be a savings over a lifetime, to the public, of more than $300,000. The problem I have with this meeting is the lack of vision, on the part of the organizers, to use collaboration technology and elearning tools to connect the speakers and the participants in on-going elearning and collaboration forums. This meeting was particularly frustrating because it started late and most of the people on the panel had to rush their comments. I had to leave before the final two speakers. I'm sure that out of all of the participants, there might have been only a couple of questions. What if the speakers had each posted their comments on a blog, like this, and all of those blogs were links on the web sites of ASN, The Chicago Community Trust and the Woods Fund. This would have enabled each of the participants to go in on their own time to read what each speaker had to say, and to read and reflect on the comments of each participant. The participants themselves could have connected with other participants, and anyone with a plan to actually resolve the issues discussed, could have invited others to come to his own web site/blog to talk or work together. This is the third such meeting I've attended in two weeks where I had the same frustration. The money spend on a fancy breakfast at the Union League Club could have been much better spent on setting up an electronic collaboration forum. Last week I received an email from Debrah Finn at Harvard telling me about an electronic meeting held in Boston. I encourage you to read Deborah's Wednesday, April 27 blog http://blog.deborah.elizabeth.finn.com/blog/_archives/2005/4 that is titled What's Next? Can We Foster Civic Engagement and Leadership Development with Online Tools? She describes the same type of meeting and the potential to support such meetings with electronic collaboration. As I learn of groups who are innovating ways to collaborate on-line, I'll build links to their pages on the T/MC web sites. I'll invite them to participate in T/MC conferences. I'll look for volunteers and donors who will help the T/MC integrate these processes into our own growing networking and collaboration process. I believe that there are some people in the country who are already moving ahead and fostering real collaboration. Some day when someone says, "We talked to everybody," as one panelist said Friday, they will really mean everybody, not just those in their own circle of decision makers. We can have this in Chicago. We can have this in the Tutor/Mentor Connection. In the Alternative Schools Network. In the Voices 4 Illinois Network. In the Juvenile Justice Initiative. In the Charter Schools Network. In the Illinois College Access Network. Will be have it by each of building these tools in competition with each other, creating a redundancy of costs and a duplication of effort? Of can we create an open source platform and a tech support network, that would enable each of us to use the same technology, but in our own organizational strategies. If we do this, and link our networks to each other, we'll create a path to involvement and collaboration for anyone who wants to get involved. Is anybody listing? Will you help us pave the way? I just posted a message on the blog of David Duchovny. I was one of several hundred who meet at his blog every week. It looked like most of the discussion centered around his new movie. Wouldn't it be great if just a bit focused on helping people engage in community service? A new Star Wars movie is coming out soon. A few years ago when the second set of movies was being created, I emailed George Lucas and said, "If Luke Skywalker can have a mentor, why cannot every other kid?" My goal was to encourage Lucas to add a trailer to the movie with this message, and with links to web sites where Star Wars fans could learn where and how they could support tutor/mentor programs in their communities. He did not do that, but I keep trying. Now that many celebrities are creating blogs and connecting directly with fans, it is even easier for someone to show support for a cause and provide links that encourage fans to get informed and get involved. The mission of Cabrini Connections and the Tutor/Mentor Connection is to engage a growing number of workplace adults in actions and strategies that help inner city children succeed in school and move successfully to jobs and careers. This strategy intends to support an entire city of tutor/mentor programs, not just a few good programs in a few neighborhoods. As we gather volunteers and connect them with kids, we try to encourage thinking around one central question: What are all the things a community needs to do to assure that all kids born in poverty in one year are starting jobs/careers by age 25?" If we knew what all of these things were, what would it take to build the resources and commitment of business and government to support these actions? Most people who receive our email newsletter or read our blog do not live in poverty neighborhoods and only understand the challenges inner city kids face through what is read in the newspapers on seen on TV. Our goal is to connect people on a daily basis with information and with personal experiences that help them understand poverty and the challenges kids and families face, and then provide opportunities for reflection so that more comprehensive and sustained strategies can develop that lead kids to jobs and careers. While we host information on our web sites that several thousand people use each month, we also host May and November conferences and Internet forums that encourage people to come together for networking, idea sharing and collaboration. We have done this since 1994. A major goal of these conferences is to increase public awareness so that more people in business, professions, media, philanthropy and government become involved in supporting the growth of volunteer-based tutor/mentor programs. As we end the school year our conference is intended to focus on actions that lead to better tutor/mentor programs as school starts in the fall, or that create new programs where now there are voids. As we do the November conference we're hoping to influence year-end charitable giving, so that every tutor/mentor program has the operating dollars they need to innovate constant improvement. We recognize that face to face conferences can only be attended by a few people, so we've launched Internet based workshops and discussions. We hope these make it possible for business leaders and volunteers to participate and stimulate thinking, that leads to more and better programs in the places where they are needed. Me writing this on my blog is like a mouse writing "give me cheese" in the middle of the Sahara Desert. No one is listening. However, if actors, sports figures, politicians and other public leaders write the same message in their blog, there will be many people listening. If they do this frequently, and if they take the next step of participating in on-line conferences, many of those who are listening will get involved, and stay involved. If any of you can deliver this message to public figures, via comments you place on their blogs, maybe you can help this mouse create a roar that is heard around the world. Giraffes are people who stick their neck out to help others. The Giraffe Foundation has been recognizing such people for more than 20 years. In 1997 I was honored to be named a Giraffe. I wear my pin often. I'm proud of it. It recognizes my on-going effort to stick my neck out to help make this a better world. However, this is not without sacrifice. The time spent helping others often takes away from the time spent with your own family and friends. Some times leaders are so out in front with their vision, that they are alone in a wilderness of ideas, with few others to turn to for support. It's a lonely place. In reading the Giraffe article about Marla, one quote in the article read: "Her high school principal once advised her that "a good leader does not try to make change; a good leader does what they are supposed to so that others will follow their example." But Ruzicka's resolve, commitment and enthusiasm are unflagging, as she prefers to live by the example and words of Mahatma Gandhi: "Inaction in a time of conflict is inexcusable." The war in Iraq is one of many conflicts in this world. We need more Marlas and more Giraffes who are willing to sacrifice everything to help others have brighter futures. It's the final day of the Tech Soup forum on eLearning and Collaboration. I've enjoyed being a co-host. Many people have shared information ranging from experience in organizing on-line learning to experience in facilitating an on-line community to variations in technology available. I posted my summary comments this morning, encouraging those who attended this week, and those who might attend in future weeks to take the ideas and begin to work together to create the next generation of on-line communities. My suggestion was sort of 'anti collaborative'. I said, take this fruit and plant it in your own back yard so it can multiply. If we all wait for someone to take the lead, we'll be all waiting for a long time. Why? Because everyone in the Tech Soup forum (and in many similar forums) has a full time life responsibility that is not aligned to the goals of most of the others in the same forum. Until people go back into their own jobs and organizations and begin to try to apply elearning and collaboration to achieve the mission of their own organization, they will not devote the time, energy and innovation capital needed to build on what is being learned in forums like Tech Soup. And unless they are motivated to link what they do to others, or share it freely in an open source type environment, most won't benefit from what a few are able to achieve. I post my messages here on this blog, in the Tech Soup forum, and in dozens of other forums. My goal is to inspire people to develop new and better ways to work together to help kids and to draw attention and support to my organization, so I can also have the time, talent and resources to constantly innovate ways the Tutor/Mentor Connection and Cabrini Connections can help kids in the Chicago area and in the Cabrini Green area of Chicago. I just launched my blog last week, thanks to the help of one of my volunteers. So far I cannot see any comments. Yet, in 1998 when we first launched the http://www.tutormentorconnection.org web site, we also did not see any traffic during the first week. However, we've had more than 100,000 visitors to the site since then and many people from around the world are using the resources on that site. Many of the volunteers working with us now connected with us via that web site. I'm hoping that this blog will become a journal that others will use in the future to connect with us, or to build tutor/mentor connections in any place where people need to work together to solve deeply embedded problems. As you visit and learn from this information, I'll look forward to reading your comments and suggestions. For the past three days I've been co-hosting a discussion on elearning and collaboration in the http://www.techsoup.org portal. At the same time I've been networking via internet and face to face meetings with a variety of different people. I told you about my Monday night dinner with affordable housing people. Last night I had the honor of meeting Dr. James Comer, of the Yale Child Study Center. Dr. Comer talked to me and about 100 other people about his vision of transforming the learning experience. He ended with a call to action. "We need a political movement" he said. I attend these meetings to hear the speakers and for the networking. As I walked up to Dr. Comer at the start of the evening to buy his book, I recognized the lady sitting at the table with him. It turns out she has kids at the same elementary school in Park Ridge that my kids go to. I've seen her. We've never talked. Yet she's been involved with the Academic Development Institute for almost 20 years. When I sat down for dinner and introduced myself, I found that I was sitting with half a table of leaders from the Center for Social and Emotional Learning at UIC. I get their newsletters and think they do great work. I've been trying to get them to share their knowledge via the T/MC conferences and to brainstorm ways people with their expertise could be part of every tutor/mentor program in the city. Up till now we'd made no headway. Maybe this networking will move us forward. Last Saturday I attended the Kellogg Manager's Ball held at Navy Pier. Cabrini Connections was one of four charities to benefit from this year's Manager's Ball. More than 400 people attended and the silent auction goal was to raise more than $20,000. In each of these networking events there were people with many talents who could be united as an army of compassion via the internet and elearning and collaboration. The organizers and speakers of these events could be using blogs, like this, to call on others to get involved. I suggested this to Dr. Comer and I also suggested this to Norman Rice, former Mayor of Seattle, on Monday . If such leaders were posting their speeches on blogs or other web sites, we could link to them and they to us in ways that increase the number of people who are inspired by their words, and who use our maps and on-line learning to focus on neighborhoods where kids need more adult help to grow up and reach careers. When I attend these networking events I see bright and powerful people who could be tutors, mentors, leaders, donors, advocates in an on-going campaign intended to change the support system for inner city kids. Such groups could hold business as accountable for their role in pulling kids to careers as business leaders want to hold teachers and parents accountable for their role of pushing kids to reach their potential. However, I don't yet see a fundamental commitment to connect members of these events to each other and to other groups focused on the same cause, using elearning and e-collaboration technologies that are now affordable to most organizations. When that happens we'll begin to see greater responsibility from more people and that will not only begin to solve some of our problems, but we'll reduce the need for big government to solve these problems for us. Yesterday was the first day of the Tech Soup on-line forum on eLearning and collaboration. Today people are exchanging information about the various forms of on-line communications. I attended an affordable housing forum last night at the Union League Club in Chicago. The two speakers were great. One was president of the National Housing Conference and the other was the former Mayor of Seattle. More than 100 people attended, and while I knew a few, most were people I'd never met. This forum was a traditional meeting where speaches were made and there was some Q&A. I've been to many of these. And, as I learn more about on-line meetings and collaboration technologies, I get more and more frustrated because we keep missing opportunities to connect participants in these forums with each other, and with the speakers, and with a world of on-line knowledge, in ways that people can stay connected in the days, weeks and months following the forum. I envision a day when people in face to face forums will have computers or ipods that enable them to interact with everyone else in the meeting, and enable them to show their agreement, disagreement with the speaker on an ongoing basis during the meeting. Such forums will encourage everyone to ask and give information. Such forums will be connected to similar forums throughout the world. They will be web cast live, and the text will be part of on-line forums, available the next day for anyone to read, learn and get involved. While that day will certainly come, I think it will come faster as some of us find partners who will work together to build and demonstrate this process in their own actions. We're looking for such partners to support the Tutor/Mentor Connection. Today is the first day of the Tech Soup forum on Online Learning and Collaboration. I'm a co-host. However, I'm really just a rookie. I've been using a variety of tech tools, such as this blog, to reach out to people interested in helping kids move from poverty to careers. I don't have a lot of time, or a lot of tech skills, so I depend on volunteers to help. I've found many volunteers via the Internet. For instance, this blog page was set up for me by a volunteer who contacted me a couple of years ago about helping. During the forum I'm hoping a few other T/MC volunteers will come forward and talk about how we've connected via the Internet, and how our collective work is intended to help more programs connect workplace volunteers with inner city kids. One of my beliefs is that the Internet can be a meeting place and it ultimately should serve as a proposal for anyone to review to understand what an organization does, why they are needed, and how someone can help. All you need to do is find a way, via a web site, a blog, or some other tool, to create a place where you can share your vision. We've had more than 100,000 visitors to our web site. Most have been people looking for help in starting or sustaining a program, or looking for a place where they can volunteer or enroll a youth in a program. Our hope is that donors will also find the site and then decide how, or how much, they want to help. This is happening, but happening slowly. Last Friday a donor called and we had a nice conversation. Maybe that will lead to a partnership. At least its a start. I think others can duplicate this strategy for building an on-line community. I think forums like Tech Soup can connect us, and share ideas that any of us can use. During the week I'll share some of my impressions as I learn more how to share my own experiences via this type of event. interested in learning more about on-line learning and collaboration. you'll spread the word so others also join in. What are the issues and challenges involved in using online learning? and individuals move into the online world quickly and efficiently. organization with its educational goals. * A live demo of a synchronous session . * The steps it takes to go from in-person to online learning. and moderated by Janet Salmons, Vision2Lead, Inc. In a Sunday, April 10, 2005 Chicago Tribune article titled "Workforce needs polish, U.S. businesses declare", the secretary-treasurer of the New York State AFL-CIO was quoted as saying, "If we infuse education and job-training with an emphasis on 'employability skills,' then we develop workers who not only can get jobs, they can keep them as well." That's a message the Tutor/Mentor Connection has been saying for more than a decade. We believe these skills need to be mentored, not just taught in short classroom sessions. Furthermore, we believe that youth living in innercity poverty struggle to succeed in school and jobs because there are too few adults who have jobs and careers in diverse industries modeling the expectation that everyone works, and that there are many career opportunities available to those who develop their personal, academic and employment skills. While the Tribune article shows the traditional approach of business and schools lobbying legislatures to develop and fund such initiatives, the T/MC believes that business has the most to gain or lose from any delay in the development of comprehensive mentoring-to-career strategies that parallel higher academic goals. I encourage you to visit the Tutor/Mentor Institute section of www.tutormentorexchange.net and read some of the short power point essays. From these you'll see that our focus is on helping comprehensive, volunteer based tutor/mentor programs be in all the places where they are needed and that we serve as an intermediary connecting people, ideas and resources from all over the world. In one power point we illustrate a PUSH and PULL strategy. Parents, teachers, tutors, mentors, coaches are all PUSHING kids to maximize their potential. If these resources are available consistently in the lives of kids, there's a good chance most will respond. However, in neighborhoods of high poverty, most kids don't consistently have access to adult who are PUSHING them to do their best. Even when such programs, like www.cabriniconnections.net exist, we compete against negative traditions and influences such as welfare, gangs, illegal income habits, etc. that reduce our influence as youth grow older. In these communities a vocational mentoring strategy needs to be in place, led by industry, unions, chambers of commerce, etc. 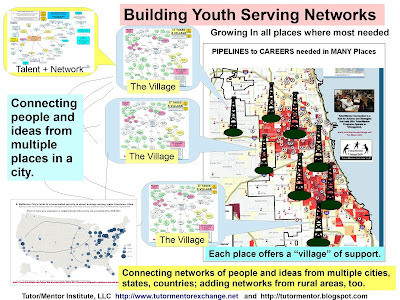 Such a strategy uses business resources (people, ideas, technology, dollars, jobs) to create a PULL system, that reaches kids as early as first grade and stays connected with them in age appropriate mentoring, job shadowing, internships, etc. until the youth is an adult and in a job/career. Such programs are needed in every major city of the world. If we wait for the school bureaucracy to recognize this as a responsibility, or if we wait for elected leaders to make this public policy, we'll still have this need 50 years from now and America may be a second class economy. Business must take the lead, innovating ways to reach kids in every neighborhood with programs that mentor kids through school and careers. While the Internet can connect the T/MC with others around the world who want to learn about this vision, or who already incorporate these ideas in their own work, local intermediaries are also needed to lead and implement this vision in their own community, with their own business and universities as partners. While T/MC maps point to Chicago, Philadelphia maps should point to Philadelphia and Miami Maps should point to Miami. Instead of leaders of networks and individual programs constantly competing with each other for resources, I want to create a meeting place on the Internet where we can talk of ways of working together to increase resources for each of us. In such communities we'll look at what works and try to innovate ways to make what works available in this network of tutoring/mentoring and education to careers programs. No matter where you are in the world, you have the potential to be gathering people in your network to participate in this discussion, for the purpose of building more and better places on the East Coast, West Coast, in the UK or in Australia, where good programs meet more youth. As we locate programs working with youth and do more to help them get visibility, volunteers, dollars, technology, ideas, etc., we'll begin to stimulate the growth of better programs and that will soon accelerate the movement of more kids through school who are prepared for careers. Are you already involved in such work? Let's find a way to connect. On Thursday I posted an email to a network of volunteers who have been working with the Tutor/Mentor Connection. This network has been growing for several years. I recognized that blogs could be a way to expand the community of people talking and sharing information about volunteer based tutoring/mentoring, as well as educating people to understand this as a form of workforce development. However, I did not have the time or tech knowledge to set up a blog. Within 2 days one of my volunteers responded and set up this blog. the April 9th message is the email I sent. This demonstrates the power of the Internet to create a virtual community of people dedicated to the same cause. As I learn more about how to add features to this page I'll add links to other blogs where people who also care about helping kids from poverty to careers are using their blog to generate ideas and actions that lead to the increase of volunteer based tutor/mentor programs where they are needed and the increase in the ability of these programs to connect kids with workplace volunteers, vocational education, jobs and careers. 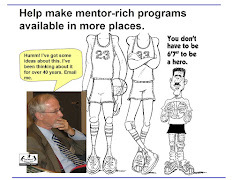 I hope you'll visit the http://www.tutormentorexchange.net and http://www.tutormentorconnection.org web sites and learn more about our work, learn about the resources available to help you get involved with tutoring/mentoring, and ways you too can become a virtual volunteer. Together, we can build a better operating system for helping kids move through school and into jobs and careers. I've been taking a look at the blogging community in the past week and feel that this is a great format for creating on-going dialog about volunteering, community service, civic engagement and tutoring/mentoring. Most blogs only connect to other bloggers. I'm looking to create a blogging space that links to the T/MC web sites, so that as people talk about tutoring/mentoring, we can use maps, charts and other web links to show them where, why and how they can be involved. If we can create a space for this on a T/MC web site we can be a hub for bloggers throughout the world to connect, link, and increase awareness of the Tutor/Mentor Connection and the work we do. If you're not a blogger, maybe you visit blogger sites or know people who blog. Try to spread the word. I'll look forward to hearing form any of you who have ideas about this.